This is our delightful little tree. I took this a couple weeks ago. It has presents under it now. 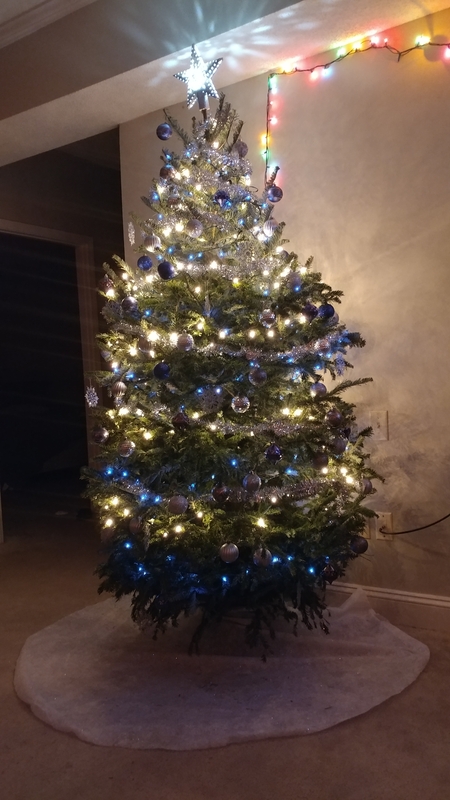 Its my first real tree. I wanted a fake one, but my gf said otherwise. So we compromised and got a real tree 😛 Merry Christmas everyone!! Sorry I haven’t been more active on my blog, but I’ll be back in action real soon. Love you all!!! What a lovely tree!! I’ve always wanted a real one but an artificial one is so much easier. I know! I had to tie it to the roof of my car and keep water in the tree holder thingy amd everything! She loves it though. Haha it was. I didn’t put a tree up in my home this year due to having a cat. But maybe next year. Thank you, Erika! Happy Holidays!! Thank you Asha! Right back at ya😀!